I was SO excited to find out they opened a second Sofi's Crepes location in the Women's Industrial Exchange building (along with my other favorite, Dogwood Deli). It's always a welcome change when I can eat something other than a sandwich for lunch. Sofi's Crepes are a great homage to the perfect Parisian Crepe, and trust me, Dan and I ate a ton of these when we were there. They make the crepes to order, so they don't pull out pre-made crepes and then heat them up with the toppings- very important to me! They also have a large list of savory and sweet crepes, so I am very eager to try each and every one. 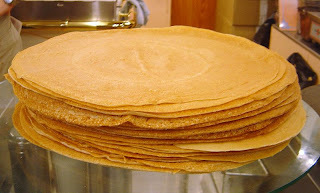 But I must warn you- if you are like me and your eyes are bigger than your stomach, I am telling you right now that there is no possible way you can eat both a savory and a sweet crepe in one sitting. Trust me. I tried. I ordered the Crepe Florentine for $8. This included fresh spinach, mushrooms, gruyere cheese, sunflower seeds and a Cilantro Parmesan sauce. To be honest, I don't remember tasting any sauce, since the cheese is so strong in flavor, but the whole crepe was incredible. It's a great sort of comfort food choice. I also purchase the $5 Nutty Banana that comes with nutella and bananas. Oh I was so sad I couldn't eat this immediately. It felt all warm and gooey, but alas I had to save it for the next day and unfortunately it wasn't as delicious as right off the grill. Overall, I am delighted with Sofi's Crepes. I would love to go back again and again and try all their selections! ohhhh i totally do! In fact, now I kinda want to get a crepe myself :)! hey nakiya..do try an indian crepe called masala dosa at an indian restaurant called spicy garden in ellicott city..
Yum! I LOVE Masala Dosas! I'll never heard of Spicy Garden in Ellicott City. I have had them at Udupi in College Park though, and they were great!